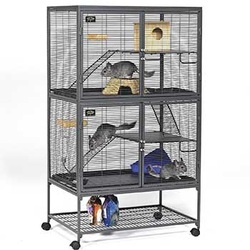 If you're looking for an inexpensive cage that is appropriate, we suggest the Petco Rat Manor. Keep in mind, however, that the Single Critter Nation is not much more of an investment and it is a lot better cage. Most Petco locations stock it, or you can order it online, often with free shipping. Two boys or three girls would fit fairly comfortably. If you're considering adopting from New Ken Rat Rescue, please do not plan to use anything smaller than this. New Ken Rat Rescue highly suggests at least the Single Critter Nation for a quality home your rats will absolutely love. Often you will find this site has one of the least expensive prices but do be mindful of shipping since this is heavy. 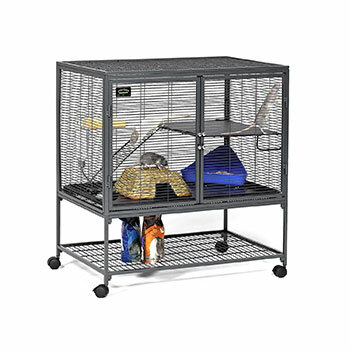 Five boys or six girls max would be ideal for this cage. Read what owners of this cage have to say. The Double Critter Nation is two singles, stacked! 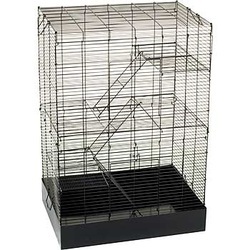 It can either be opened up to allow full range of the cage, or closed to separate the top and bottom either permanently or just for cleaning. Ten boys or twelve girls are a comfortable maximum with this cage. Again, check this site for pricing. There will likely be a shipping surcharge. Martin's makes some good cages as well. Shown is the R-690; cages smaller than this would likely be inappropriate. Powder-coating is highly suggested as galvanized wire is likely to be affected by urine, adding to the smell. This may not be as easy to clean as the Critter Nations.